This Sprint Micro-USB Vehicle Power Charger connects your phone to your vehicle's power outlet for simultaneous talk and charge. Yellow LED illuminates when charging. 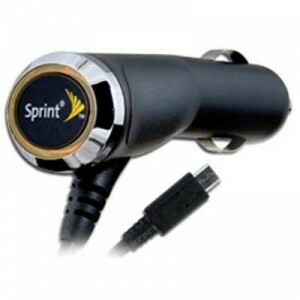 The Sprint Micro-USB Vehicle Power Charger, manufactured by Sprint is compatible with the Sprint Evo 4g, BlackBerry Curve 8530, BlackBerry Tour 9630, BlackBerry Bold 9650, HTC EVO 4G, LG Remarq, LG Rumor2 LX265, LG Rumor Touch, LG LX290, LG LX370, LG LX400, LG Lotus LX600, LG Lotus Elite LX610, Motorola i9 Stature, Motorola RAZR VE20, Motorola RAZR2 V9m, Motorola Renegade V950, Motorola i576, Motorola Brute i680, Motorola i776, Motorola i890, Sanyo S1, Sanyo SCP-2700, Sanyo Katana LX SCP-3800, Sanyo SCP-3810, Sanyo Katana Eclipse SCP-6750, Sanyo Incognito SCP-6760, Sanyo Pro-200, Sanyo Pro-700, Samsung M220, Samsung M240, Samsung M320, Samsung M330, Samsung Seek M350, Samsung Rant M540, Samsung Exclaim M550, Samsung Reclaim M560, Samsung Highnote M630, Samsung Moment M900, Samsung Instinct HD S50, Treo Pro and Treo 800w phone models.